Real Housewives of Melbourne Season 2 EP 13 – Reunion Part 2 – It’s a Wrap! RHOMelbourne Season 2 EP 13 – Reunion Part 2 – It’s a Wrap! Jackie and others try to fill in Alex on what really happened to start the brouhaha… apparently Petti had been digging at Gina all day and accused Gina of not being a barrister because none of her friends had ever heard of Gina… and the ladies agree they were having a conversation and not an argument…Petti is backstage insisting that everyone is lying about her and she WILL NOT STAND FOR IT…Janet tells Alex that for all the remaining ladies on the couches to agree – that he should know they were telling the truth…Petti is saying she cannot respect people who are lying. Personally I think the Diva behavior is a bigger pain in the a$$, but there will be a moment later on that even beats this DIVA moment by the Head Diva Lydia…but the last snark before Petti returns was from Janet who said to Chyka and Jackie…”Get the other f-ing leg to your outfit, all right?”…Chyka laughs. (Petti’s outfit it is a one legged jumpsuit with a flowing skirt slit up the front…not at all attractive. Petti insists she only EVER drinks “two glasses max”. (Honey, I know the measurements are different over there with that silly metric system and all, but be reasonable…HOW BIG WERE THE GLASSES…I liter, 2 liters? Janet saying everything Petti is saying is a lie…Petti is talking over the top of Janet (which is hard to do…) and says she is not going to talk about it any more…riiiiiiiiiiiiiiiiiight! Alex gave Petti a lead in to talk again about her upbringing and she tells him “it feels awful” when people tease her about her accent. Gina insists that teasing someone about their accent isn’t racism, Chyka think it’s quite “condescending, and DIVA Lydia must have forgotten when she agreed with Chyka that she made fun of Gamble saying Hawthorne, AND called Petti a Mongrel! Petti says these girls think I have an accent now…well 30 years ago I had a thick accent…Gina says…”We think she does? She does!” Gina then asks “What is racist, that we say you have an accent and you do?” Chyka says something and then Gina says “It’s not racism – it is the way you speak!” Now Petti tries saying if they were mates it would be ok…Gina says I thought we were mates…we just didn’t click as good friends. Can’t write more about this I have been doing it all season…nothing will change Petti’s understanding of it. The next montage is of Jackie’s only storyline in Season one about being psychic, continued into Season 2 with Chyka’s help…and Jackie has now escalated it to them attacking her profession…blah blah blah…and her analogy is she could have made fun of Gamble’s paintings saying they looked like a 5-year old did them…but finishes with she doesn’t throw shade at people…riiiiiiiiiiiiiiiiight! Alex says the ladies are ladies…but don’t always act ladylike and could make a sailor blush…the next montage starts about all the ‘catch phrases’ and ‘sexual innuendo’ the ladies use (and these clips we will never be able to UN-see…since they are now etched on our retinas) while winding up with a wonderful montage of Gina adjusting ‘the girls’ throughout the season. Rick joins Gamble on the couch and they talk a little about their relationship, they met on e-Harmony.com, have been together for 5 years, and when asked about the wedding, Gamble and Rick announce that their wedding will be in September and will probably be filmed in Season 3. (I REALLY LIKE THESE TWO). Everyone notices Rick has lost weight, and Chyka comments on Gamble serving him only frozen peas, and Wolfie Pup going out at lunch for a big ole greasy burger. He clearly loves her and she clearly loves him – GOOD ON THEM!!! Gamble says this relationship is different from any other one she has had because Rick is not a psychopath! Janet thinks it dragged on for so long because “‘somebody’ could have butted in within 2 seconds and completely stopped the pain that I went through for the whole season over this” (everyone immediately looked at Gina…LOL…) before revealing that “one of the girls in this group” let Janet take all the blame for that rumor when she was the one who heard it first and told Janet. Lydia is finally outed as the person who knew…but contends she was in Florence when it aired on the show and didn’t see any point in jumping into the fray upon her return. Miss Lydia knew EXACTLY what she was doing to Gamble and with both Janet and Carlos – Miss Diva sure likes to deflect and misdirect to get the attention off of herself doesn’t she? She is as bad as a silent but deadly fart! This is another area I cannot possibly write on again! Only the good Lord knows why Alex then brings out MANuela who walks right over across to the far couch and wants to sit next to Alex (IN GAMBLE’S seat…and hence, meaning all the women should slide down one seat. Nay nay my little friends, LYDIA DIVA refuses to be slid to the end of the couch, and says so out loud! After a couple of awkward moments with MANuela and Lydia, Gina gets up and moves to the other side of Lydia and Gamble slides over (which she NEVER should have done because it is what MANuela wanted to intimidate Gamble further). MANuela and Gamble of course have words and they show a montage of the different places she was on the show and how aggressive she was towards Gamble. 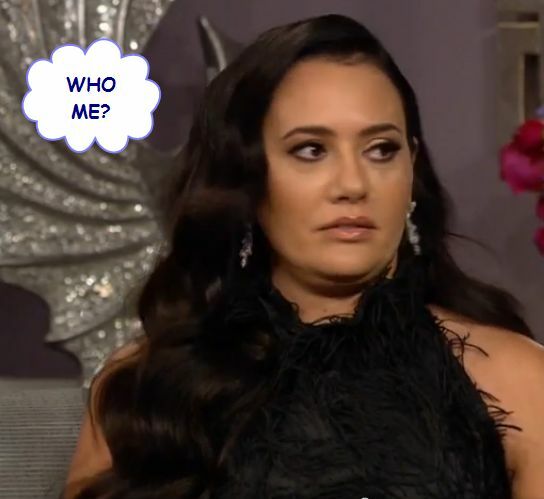 Alex had a FB question or asked the question (I forgot which) about MANuela wanting to take Gamble’s spot on the show to which she tosses her head (not far enough) and says she doesn’t want Gamble’s spot (riiiiiiiiiiiiight)…(I am guessing she will get Petti’s spot because she has been campaigning for her own spot all season…and Janet will gain an ally to replace Petti who she obviously has kicked to the curb). MANuela was downright rude to Gamble during her short stay on the couch which then precipitated an under-her-breath comment from Gamble to MANuela, which is the opposite of a comment that factually described how crapppy MANuela actually looked at the reunion (Rode hard and put away wet)…YES LADIES I AM SPEAKING OF HORSES! Geez, don’t get your knickers in a wad…I don’t talk like what she said because I’m a lady DAMNIT! A short segment on Gina rumors…where Gina has to explain AGAIN, that going to the source and asking a question is NOT brandishing rumors all over the place. Lydia says “I’m getting quite bored here…and Gina concludes the season by reminding Lydia of her faux pas on floor counting when she says…OK 71th! I want to thank Veena and y’all for allowing me to blog over here and recap this season, I have had nothing short of a blast…and I have one last blog of the TWITTERFEST and POSTMORTEM of the entire season…that I would like to do for next week since we have now seen it all and heard it all. This entry was posted in Real Housewives of Melbourne. Bookmark the permalink. 68 Responses to Real Housewives of Melbourne Season 2 EP 13 – Reunion Part 2 – It’s a Wrap! Great blog Reality_Bytes! I’ve really enjoyed your blogs very much. I also enjoyed this season of Melbourne. I liked them all – absolutely some more than others, ok I didn’t like PettyPerson – and even through the bickering, for me at least, I got the feeling they all were friends and making good tv. The Gamble and Dr. Wolf relationship was fun to watch. We didn’t see Chyka’s husband much or Lydia’s husband, and I gathered through comments that Lydia’s husband was very seriously ill during this season. I thought that a little strange she didn’t bring it up, I mean not even a reference? I don’t have anything against physics, and have been to more than a few, but enough already with Jackie constantly saying I’m a physic, you know. In the end, I enjoyed this season more than I enjoy some of the other HW shows, and I hope they come back sorta. My only reservation is it seems to me that after season 2 all the drama is manufactured, over the top, mean and hateful just for TV. I’m not interested in seeing that show. Haha Maybe Jackie would be more credible as a physic lol, but I meant psychic! LOL! I hope it wasn’t too hot at the JD walk and they raised a bunch of money. Thanks ladebra…I think Mr. Lydia has not wanted to be a part of the show from the beginning, and is seems she used his health silently to avoid runor-gate…and I loved your Freudian slip from physics to psychics! Good morning everyone. Hope you’re weekend was a great one. I hope everyone is having a great day even if bad things are going on around us we still need to smile and laugh. Anyone dealing with pain, sickness or a diagnosis not expected know that prayers as well as positive energy is being sent your way. I love this little family and know you’ve all got my back. I didn’t watch these ladies last year but did enjoy the show this year. Not a fan of Petty, don’t like her at all, don’t like the one who is trying for her spot either. Not to much into the psychic either, she’s mean nor the one to the right of Gina but I did like the rest of them. Gamble grew on me as the season went on. I haven’t watch Melbourne, but I enjoy the blogs. It makes it better than actually viewing the show. We have such talented bloggers here. I missed MelTheHound blogging Survivor so next season I’ll blog it. I can’t wait until June 12th to be done with my job. I love it, but I’m ready for the off time for health, home and hospitality. I want our home ready to entertain friends and currently it’s not. I might learn how to refinish a hardwood floor and do it myself. It’s only 2 rooms. You think my DH would let me sell the living room furniture and workout/computer room/ vanity room stuff too? It’s crazy we have a multipurpose room with a goofy mixture, but it works. Glad to hear you might be able to blog and glad you can step away from your work and focus on yourself! Good luck with your projects! I love a product called wood Preen. It strips and waxes at the same time! That may be all you need. It’s amaze balls. I’ll be checking this out at work tomorrow to see if I can do it. Thanks!!!! Yay! Next Survivor looks really interesting! So glad you’re going to blog. I think it’s great you’re going to take time for yourself, and your health, and your joy! Change is always a little daunting, but it sounds like you have support and lots of projects that you are looking forward to starting. That’s really great! SCOOPLET ALERT! I have nothing but a rumor from the LA friend, but she says that DrugAddictAlcoholicKim is not a vagabond running around Mexico, but is in a private REHAB facility, location unknown. The Sober coach didn’t quit, but handed her over to a representative of another facility. Word is her children staged an intervention in Mexico after the drunk/drugged out meltdown. My friend mentioned, look, Mexico outside the resort areas is a scary place, and especially so for a pampered, drug addict/alcoholic. She also said that it would be very odd that KruellaKathy and VileKyle, or her children wouldn’t have been hiring detectives, pleading for her safety, etc. if they didn’t know exactly where she was located. As with true proper rehab facilities family/friends usually don’t visit or have contact with them for the first few weeks. I again don’t know if this is true, but again my friend found it very odd that her family isn’t completely going crazy that she is by herself, ANYWHERE, let alone Mexico, and that the press hasn’t been able to locate her either. Thanks T-Rex! This scooplet is good news and far more believable than she is on a bender in Mexico. I don’t think she would last long there without someone to keep her safe. I hope you’re right. And she’s not in Mexico. Even rehab facilities in Mexico are no Bueno and not safe. Better she’s somewhere for 90 days and not being held for ransom. TRex fantastic scoop and makes perfect sense. So happy did all my Mexican vacays years ago and had so much fun ! That sounds better than everyone thinking her family just left her there. Somehow that never made sense. They seem to be close and not the type to go off and leave a drunken idiot in a foreign country by herself and for that matter you would think the rehab center she was in would have known it was always a possibility she could relapse on this trip and had plans in place incase that happened as to how to deal with it. This just makes a lot more sense. Hopefully she is in a real place this time. Yeah it never made sense to me that her sisters and children wouldn’t be FRANTICALLY looking for her after she just went off the deep end at the wedding by taking Drugs and/or Alcohol, to wander around Mexico. One thought that just came to me that supports this scooplet is that if you do a google search for news on Kim Richards, all you get are tabloid news items. I’d sort of expect if a wealthy star from a prominent family disappeared right after a public family scene in Mexico AND if it was a real disappearance, local law enforcement might have been informed and the legitimate press would be carrying articles. That is, unless the family hired some Blackwater (no pun intended) mercenaries to find her. And if the mercenary story hits the tabloids, I hope you’ll remember you heard it here from me first. RealityBytes – The only sad part about this season was that I didn’t watch it all and the flip side was having such an invested blogger tells us what goes on! 👏👏👏👏👏 I enjoyed the reunion last week and was looking forward to part 2, but the storms took out my TV. I would have had a complete ROTFL to have witnessed the Manuela entrance, and the Gamble smack down, lol. So you went the ladylike route, ha ha. Gina situating the girls, LOL. The best comment of the whole reunion was the one you captured in a still frame of Gamble asking Gina at the end, LOL. All the P references in the title and the pitter patter on stage, very funny. So much to laugh at with this group..wish the US ladies were more free flowing and forgiving as these women are. Maybe it’s they can laugh at themselves and own up to stuff, well, all but maybe 2 of them. How do you think a third season would change their dynamic? That’s assuming, no cast change. Why do you think the US won’t invest in this group? I mean one showing only is unlike ANYTHING Bravo airs – they repeat the hell out of everything else. Looking forward to the postmortem, lol. Thanks again! WOW (as Lydia would say)…that is a great question about the dynamic TT! I am not sure…maybe more tolerance since so much got brought up and somewhat resolved this season. Janet will be unbearable if MANuela gets on, and I think maybe she will push to have her on more because I am not sure she can come back from the Twitterfest stuff with Petti,..she got down and dirty…so she lost a supporter there…I am not sure which way Petti will go if she stays on because she said the only reason she came on was to get her book out there…she has no real storyline…Gina tried humor this season and that didn’t work out well with some, bu maybe her storyline next year will be the TV Soap she is going to be on. As for BRAVO, well…I think the show slid in under the radar last season and has gained legs this season, so maybe they will start having the ladies on WWHL (although those plane tickets will be a lot pricier than CA to NY) I hope they were watching the rise in blogging, not just this site but many more carried blogs this year both here in the US and in Australia, and they have been all over Twitter, but it is hard to gauge what the reception really is. Chyka, Janet, and Gina were the only ones with continued storylines this year…Jackie and LaMascara were kind of hit and miss and Gamble will have the wedding next season…Lydia is a hamburger short of a Happy Meal storyline, and Petti will be too. Now the question comes back to you! What do YOU think??? LOL. Very interesting! Thanks for the reply! Um, I’m not sure I am familiar enough to have a good feel for that, it’s why I asked you! 😛 Maybe I will have more to say after the twitterverse/postmortem. Looking forward to it! OMG! I haven’t read the blog yet, but before I do, I have to say…. ADVERTISERS! STOP WITH THE MUGSHOT OF THE MAN WITH HALF HIS SKULL MISSING! I DON’T NEED TO SEE THAT–FOR THE HUNDREDTH TIME! Whew. Just needed to get that off my chest…. Adblocker Plus. It’s free but it never took away enough ads to suit me …some folks here claimed it takes them all away. I always end up uninstalling it for one reason or another – but you don’t have anything to lose by trying it! What device to you read the blog on…it is available for most. AdBlock Plus works well for me. I use it on both a laptop and desktop. Win 7 64bit on both and I use Chrome as my browser. I use a desktop and a tablet. I’ll try it out and see what happens. Thanks! Good Luck, it is great!!! Lol- I see that guy from time to time. For those that have Twitter have you joined Periscope? It’s a live events app. I had been trying to join it for about a month but it wasn’t available for Android. Of course it was for Apple. 🙄 A nail polish company that I purchase from and follow on Twitter Zoya has live events. They tweeted this morning that they were having an event. I tweeted them back I couldn’t because I have an android. I went on Periscope’s Twitter and low and behold they made the app available to android on 5/29. I downloaded it. When you open it it suggests who you follow on Twitter that are on Periscope. I chose to let it follow the suggestions. Emerson from The People’s Couch is one. He sent out an invite to watch some friends. It was stupid. This girl and guy eat bagels. So silly. A few minutes ago one of the actors from Empire sent an invite to his followers. Actor Yazz. Yes at the Critics Choice Awards. He’s in the blue carpet taking the viewers w/him. A pop up comes up and you can chat. When I get these invites a sound like a bird chirps. I suspect you can turn that off. It’s really cool. No, thanks for the information! So is Petulant Petite Petti’s Pretty Pity Party! Thought of you as I just drove 3mph in 10 feet of water from Laguardia. Thank you everyone for all of the cards, letters, and kind words of support I love, love, love you all xo T! Who has her Twitter account? Gia? Somehow I think Joe could care less about thanking her fans. Frankly, I’m surprised a message hadn’t posted there before today. Ops ! Should have refreshed the page! Here come the crazy stories and theories! No way this is really her, this is probably her daughter or someone from her attorney’s offices. That’s because B didn’t post the pic. From a lot of pics and tweets I think that one StHeatheroftheTwear is odd HO-wife out this season, me thinks she and DrunkDelusionalGreygardensSonja get the heat thrown at them at the Reunion, we shall see. Great Blog RB!!! the only thing they agreed on all season was the Petty Flour was smashed!!! That seems to be the only thing they all agreed on. I’m guessing she was really drunk if she couldn’t remember it. That WAS an important one so I am glad they finally came together, LOL!!! This made me smile…. The good ol’ kitty days! I once had a terrier that would grab the end and run thru the house with the TP. Bless his heart. I work with a girl who has a Charlie kitty who plays with the TP every time she leaves the bathroom door open. It just makes me laugh, if I were a cat, I think I would play with it too!